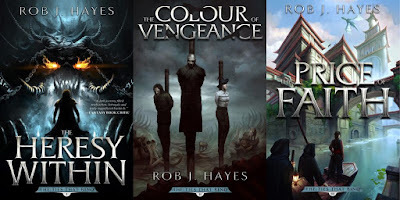 Rob J. Hayes is an author who really made a mark with his writing style, superb characterization and a fascinating world that offers many secrets. I've been following his career over the last four years and have gotten to know him a lot. 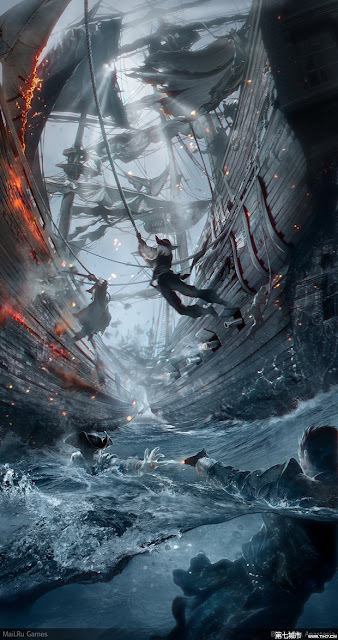 In this interview, we talk about the long delay behind the sequel to his debut trilogy, the reason for focusing on pirates & the lack of pirates in the epic fantasy genre. 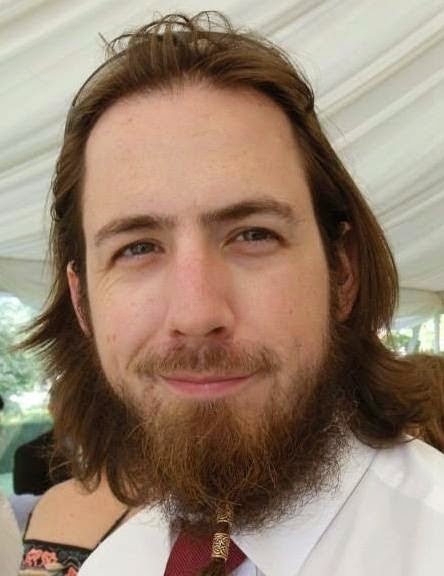 Read ahead to get to know more about Rob and enjoy. Q] Welcome back to Fantasy Book Critic, it’s been a long wait for you since your last release. How are things with you? RJH: Thank you for having me back. I am quite well, though my fingernails are bitten down to the quick as always seems to follow a new book release. Q] You have spoken a fair bit about the troubles you have experienced with the release of this duology due to Ragnarok Publications. Can you give our readers a breakdown of the events that lead you to part ways with them? RJH: Well there were a number of issues that led to my decision. The first and foremost was definitely their handling of Where Loyalties Lie. They originally planned to release the book in December 2016 and it was delayed time after time without any real signs of progress towards. In fact they never even edited it. They also passed the unedited manuscript on to Audible to produce the audio version. This was a big deal to me because it means that version of the book, that is out in the world, is not a true representation of my work. It's not the finished book I wanted to release. There were also consistent issues with late royalty payments and a general silence from those in charge. When all those issues combined, I decided it was time to jump ship rather than be dragged under. Q] Talking about Best Laid Plans, your follow-up to your successful debut trilogy, The Ties That Bind. Why did you choose to follow up with completely new characters (excluding Drake & a couple who made cameo appearances)? RJH: Well The Ties that Bind was a sort of spaghetti western style of series. It focused on that Wild West feel and the idea of witch hunters traveling the world and looking for heretics to burn. Best Laid Plans was always meant to be about pirates. It's pretty much all about the pirates. Most of the main characters simply wouldn't have fit within the story I wanted to tell. I also have this plan for the world. There will be four separate series and one stand alone novel, each will contain its own narrative, but will tie in to a much larger overall narrative. Characters will cross over from series to series, but the focus each time will be on new characters. Q] For fans who are loathe to start a new series or a new one set in the same world as the author’s previous work, what can you say to draw them in? To clarify my question, can this book (Where Loyalties Lie) serve as a jumping point to your written work? RJH: Where Loyalties Lie can certainly start as a jumping in point. In fact a few early readers who haven't read The Ties that Bind have said they didn't feel like they were missing out from not having read it, but they were certainly planning to check it out afterwards. As for drawing readers in, I would say the biggest selling point is the fact that Where Loyalties Lie is piratical fantasy. So if you feel like pirates are sorely missing from fantasy as a genre, this is the book for you! Q] Let’s talk about Drake Morass, possibly the centerpiece of this duology. In the The Ties That Bind trilogy, Drake was a behind the scene player but his actions caused many a ripple and none the stronger than in The Price Of Faith. With this series with him becoming a POV character what do you think can readers expect to be revealed about him? RJH: Drake is certainly one of the major players of Best Laid Plans. This series gives a lot more of his back story, showing some of the things he has seen and done, and hopefully that will give a better insight into why he is the man he is; always planning and plotting and willing to use just about anyone to see his goals complete. You'll also get to see Drake in different circumstances, such as what happens when things don't go to plan. It's fair to say he was an interesting character to write as Drake is very much a villain as well as a hero. Q] In my previous interview with you, you had said this about Thanquil “Only Thanquil isn't really a chess piece so much as a board flip.” So considering what Thanquil did in The Price Of Faith, how would characterize Drake? RJH: Well Drake certainly believes he's a player. In his eyes he's moving the pieces around the board, and out-maneuvering his opponents. In reality I would say Drake is much more like a Queen, the most powerful piece on board, but not a player. Q] You introduce many new characters and quite a few of them are bound to become fan-favorites. I know I certainly share a strong fascination for Elaina Black, Beck & T’ruck Khan. When you started wiring these books, did you plan for any of them to have such strong roles or did they take a life of their own? RJH: Elaina certainly did. In many ways she started off as a bit part character, but I found her so compelling I kept giving her more and more chapters through the re-writes. It's fair to say she is now one of the major players in Where Loyalties Lie. Arbiter Beck was always planned to have a subtle, yet powerful role to play in the challenges the Pirate Isles face. She is, after all, a witch hunter surrounded by thieves and criminals. As for T'ruck. Such a big man with such a big appetite needs a big part. Q] You have written a short story titled BLACK BLOOD which features characters from the Best Laid Plans duology. In your estimate, should fans read it before or after Where Loyalties Lie? What was your main reason for writing it? RJH: BLACK BLOOD can be read either before or after reading Where Loyalties Lie. It's a fun swashbuckling adventure starring Captain Elaina Black and Arbiter Beck teaming up to find buried treasure. 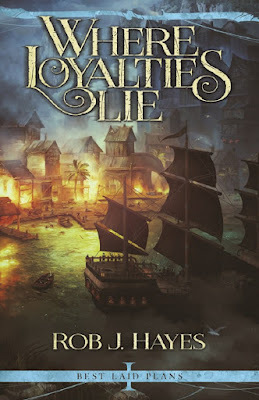 I actually wrote it prior to starting Where Loyalties Lie in order to get me in the piratical swing, but it works as a nice introduction to both the characters and the Pirate isles as a whole. Q] This duology ends with The Fifth Empire Of Man which is set to release in the next couple of months. Why only two books and what should the readers expect from the ending? RJH: I know the accepted norm is trilogies and in the planning stages I had it thought out as such. But when I came to actually sitting down and writing it I soon realised it would be two books. I didn't want to pad out the events or slow down the pace so making it a duology just seemed natural. What can people expect from the ending? Well The Fifth Empire of Man has tons of magic, pirates visiting a ruined city in search of treasure, angry spirits, tenuous alliances, and probably the biggest naval battle ever to appear in a fantasy book. 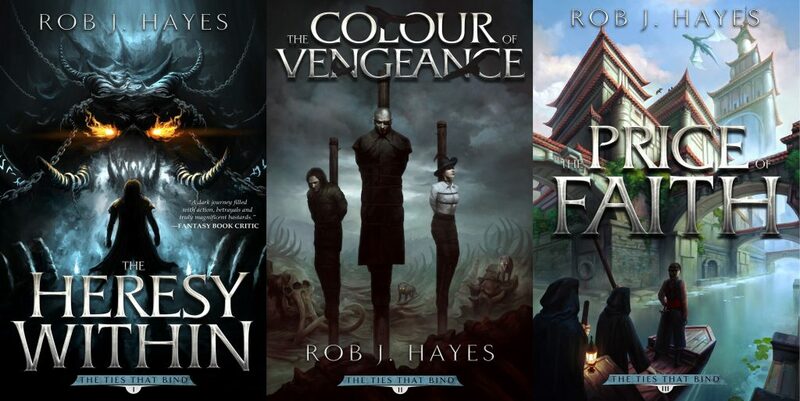 Q] You are also re-re-releasing your debut trilogy with brand new (atleast for The Colour Of Vengeance & The Price Of Faith) cover art. Please talk us through the process of creation of all three of them and why you wnt for pivotal book scenes? RJH: The creation of them was surprisingly simply. I contacted Alex Raspad, told him what I wanted, and he knocked it out of the park. Well, at least for The Colour of Vengeance and The Price of Faith. The artwork for The Heresy Within I actually had done years ago, but have since lost touch with the artist unfortunately. The idea for having scenes from the book is a personal preference for me. I'm actually not a big fan of having detailed character art on a cover as it tends to influence how I see the character even before I've read about them. Stunning vistas or action scenes, however, have my jaw dropping. Q] What comes next in the First Earth saga after the conclusion of the Best Laid Plans duology? What are you planning to write/release next? RJH: Next for First Earth, after the completion of Best Laid Plans, is a stand alone book called City of Kings. It's pretty much a direct sequel to the events of The Ties that Bind, though once again is designed to be read even without having already read any of the other books. It will feature The Black Thorn as he attempts to bring an outlaws peace to the Untamed Wilds. But before that I will be releasing a sci-fi noir book called Drones. As for what I'm currently writing... It's a secret. Q] Thank you for taking the time to answer all the questions, any parting thoughts for your multitude of fans worldwide? RJH: Just like to say a big thank you for sticking with me despite the delays that have hit Where Loyalties Lie. I know I originally promised the book about two years ago, but it is now here! NOTE: Hellstorm art work courtesy of Anastasia Bulgokova.